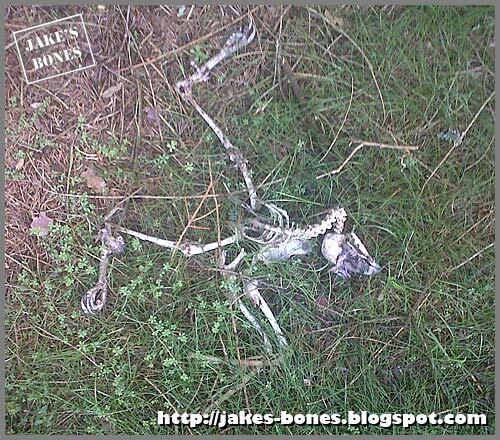 It was obvious it was a bird of prey, but it is unusual to find their skeletons all laid out like this. Dad thought it was a buzzard, because he knew they lived in those woods, but he was worried it might have been a red kite. He checked the wings and feet and couldn't see any tags, and it seemed about the size of a small buzzard. If you look closely there is a clue how it died. In Scotland it is important if you collect skulls to be able to prove how the animal died. 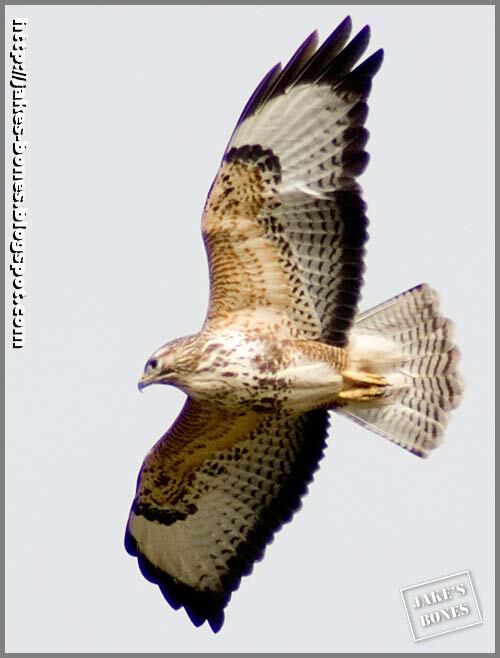 Buzzards are birds of prey, and in Scotland birds of prey are protected by law. 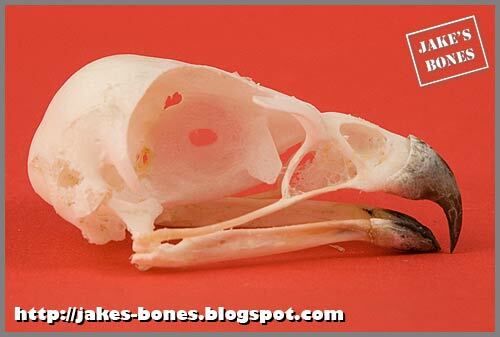 You can only keep the skull if you can show the bird died of natural causes. This is very very difficult and dad once had a policeman phone him about my other buzzard skulls but I was allowed to keep them. When Dad was walking up to Cat Skull Wood, he noticed another buzzard flying about, and a crow that was following it. 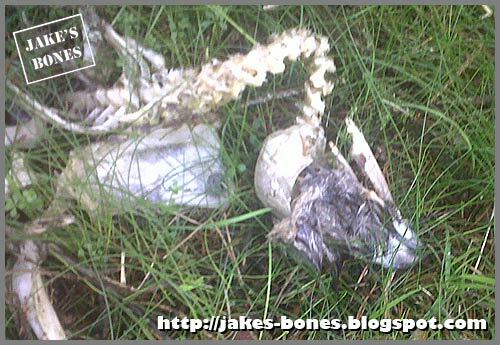 What might have happened with this skeleton is that it might have been mobbed by crows. 'Mobbing' is when one type of bird gangs up on another type of bird that it thinks is a threat. Corvids do this a lot to buzzards. Sometimes mobbing means the birds actually fly into each other in the air. Sometimes it means just tiring the victim bird out. Here is what the RSPB say about mobbing and here is more about crows mobbing buzzards. Dad took the skull home for me to clean up. It still has lower jaws and beak sheats ! I took off the beak sheaths and left the skull in hot water with biological washing powder. This is what it was like when it was cleaned. Beak sheets are made out of the same things as fingernails and hair and sheep horns. 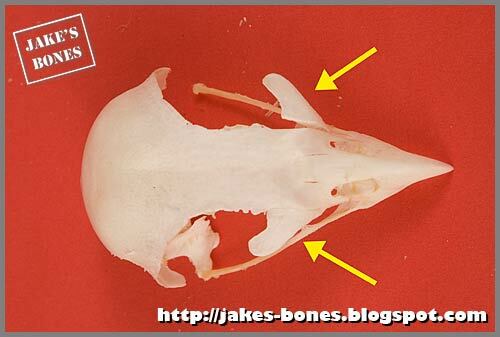 They are the outer part of the beak. 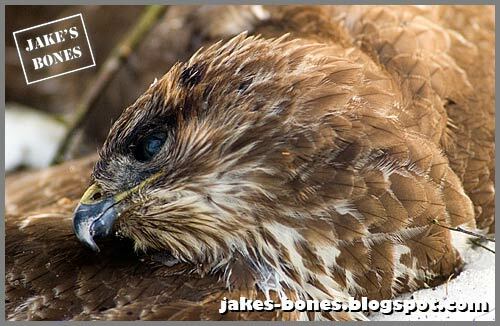 You can see them really well on this picture of the ill buzzard that I found and gave to the SSPCA. 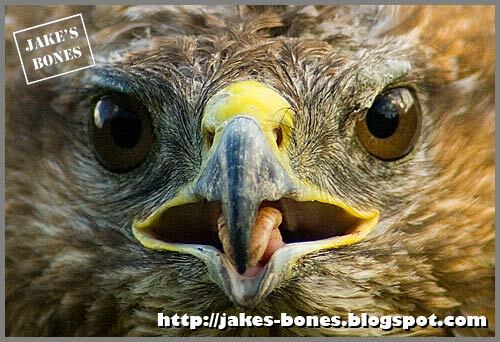 The skull also had a bit of bone that isn't there on any of my other buzzard skulls, It is called the eyebrow. It isn't on my other skulls because it is really fragile and easy to break off. There are loads and loads of buzzards round here and I really enjoy seeing them. They are pretty birds, like small golden eagles, and they are easy to spot because they are noisy and they fly around you if you go near their nests. Nice post about the buzzards. I love birds of prey, especially red kites. But buzzards are lovely and I see them often too. 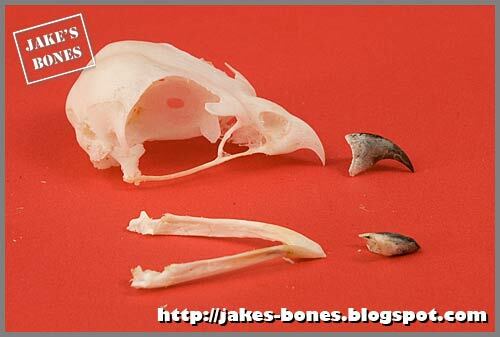 I have some bird of prey skulls too and I thank god that no one called the police about it. Of course, they are all legal and died in nature, but you are right: it's very difficult to prove that.